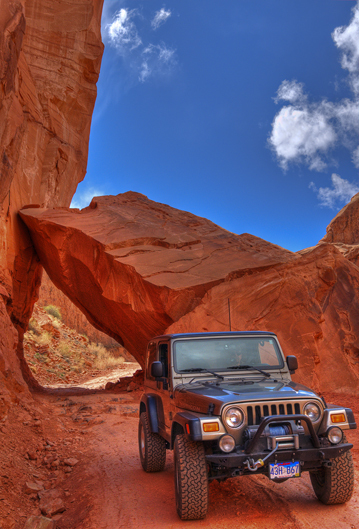 We took the jeep on our first jeep off-road Moab ride to Gemini Bridges, through Pucker Pass and down Long Canyon. It was a beautiful blue sky day with white cotton ball clouds. I have posted pics of Brad from previous visits driving under this enormous boulder that has slid down from the high canyon wall. This year we find that it had fractured and slid way down the canyon wall. Brad was still able to drive under it (no way around). I always hang back to click the pics and see if it really is safe!